Coasters don’t just serve to protect the surface they’re sitting on, they dare customers to try something different, tempt them to taste and prompt them to purchase. Think about it; 2 out of 3 people remember the messaging on coasters after their dining/drinking experience. That means that 65% of people remember your product, service, or business. It becomes a conversation piece rather than an advertisement. Why pay the premiums for people to see your message when you can get 465,750 impressions per coaster order? Here’s how: The average customer will order 2.3 drinks per sitting. Over the course of a single drink, the customer will lift their drink and view the coaster an average of 9 times. With an average coaster lifespan of 9 visits, a single coaster can deliver up to 186.3 impressions. Our minimum order quantity of 5,000 coasters provides a total of 931,500. We take pride in our work, and our Customer Satisfaction rate shows that. You can count on us to process your order quickly, correctly and help you in any other way we can. 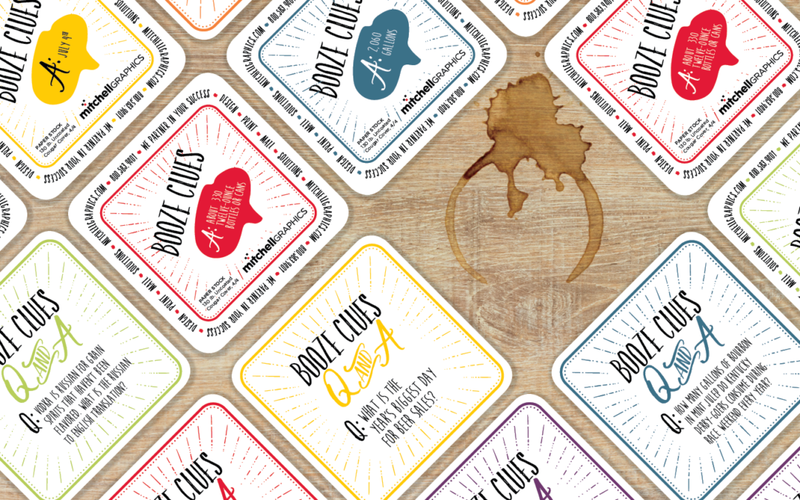 It’s when your brand strives to do more that we get to be “more than just a beverage coaster.” We have a wealth of products that can cater to your brand’s personality and cut through the traditional advertising clutter. Coasters can embody the fun, hip, edgy or prestigious personality of your brand in a unique way. Learn more and order your coasters today!